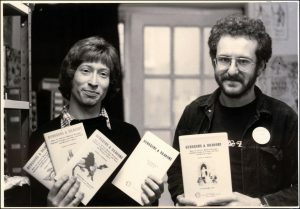 Steve Jackson & Ian Livingstone, circa late 1970s, were pioneers in bringing Dungeons & Dragons to the UK and Europe. 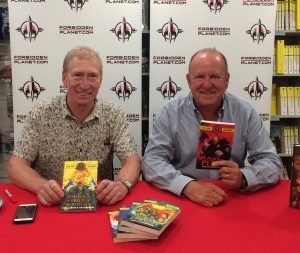 The creators of the Fighting Fantasy series of books, Ian Livingstone and Steve Jackson, are two titans of the fantasy roleplaying industry. 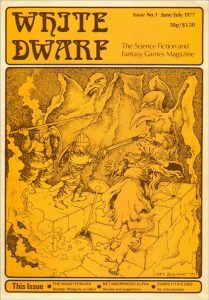 Prior to the breakout success of the FF books, they set up and established Game Workshop as the UK’s premier hobby shop, publishing the magazine White Dwarf (which is still going strong today) and were pioneers in being responsible for bringing the RPG Dungeons & Dragons to Europe. Following the success of Fighting Fantasy, both men became involved in the videogames industry and to this day are renowned and respected figures in the gaming business and community. I met them as part of my hosting duties at this summer’s Edinburgh International Book Festival, and they were kind enough to allow my inner fanboy to pepper them with questions for a Geekzine interview. This has been months in the making, so please enjoy. Andy Jamieson: Ian, why do you think the Fighting Fantasy books have remained as popular as they have? Ian Livingstone: A Fighting Fantasy book is one in which you, the reader, are the hero. They’re branching narratives with a game system attached. They allow readers to make their own choices and decisions. Linear books are a passive experience whereas Fighting Fantasy is an interactive experience which gives control to the reader. Choice is empowering and speaks to today’s video game generation. We are delighted that they are relevant to a new generation. AJ: Steve, how did the original idea for the Fighting Fantasy concept come around, and what inspired the choose-you-own-adventure system? Steve Jackson: Originally this was supposed to be a ‘how-to-do-it’ manual. But when we got to explaining, it was much more interesting to make it an interactive explanation. AJ: Ian and Steve, out of all the Fighting Fantasy books that you have written, which ones stand out as the titles you are most proud of, and why? 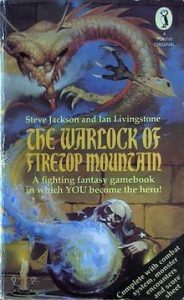 IL: It has to be The Warlock of Firetop Mountain because it was our first book and I remember going into WH Smith several times a week just to see it on the shelves! My personal favourites are Forest of Doom, Deathtrap Dungeon and City of Thieves. SJ: Warlock will always be a special one as it was the first in the series. Then I’d say the Sorcery series. That was an epic project and I was so relieved when I’d finished Crown of Kings. And Creature of Havoc. AJ: Ian, how was it having Charlie Higson write a Fighting Fantasy book set in Allansia? Did you set him any no-go areas? Are there plans for him to write any more? 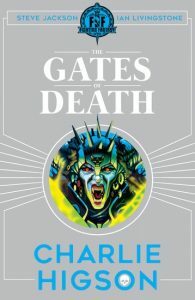 IL: It was great having Charlie write Gates of Death as he brought a new dimension to the narrative style, and also attention to the series with his celebrity status and following. We pretty much gave him free reign in our universe, the only caveat being not to mess with legendary characters and creatures. It would be a pleasure to work with him again on another book. AJ: Steve, aside from Charlie Higson’s Fighting Fantasy novel, are there any future plans for other authors to write original books for the series? SJ: Charlie’s book seems to have done well. So it’s something we’d consider. 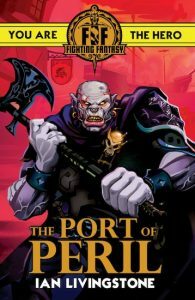 AJ: Ian, how was it returning to the Fighting Fantasy series last year, with The Port of Peril? Had anything changed in the way you approached the design of a Fighting Fantasy adventure? IL: I used the same writing mechanics as I did in the 1980s – creating a manual flowchart as I wrote the adventure, allocating paragraph numbers on the fly from a list of 1-400, and making the all-important map. But writing it gave me a dilemma. Was I writing it for 10-year-olds or for 40-year-olds masquerading as 10-year-olds? In the end, I did what I always did – I wrote it for myself, hopefully appealing to fans young and old. AJ: Steve, at the Edinburgh book festival event with Ian and Charlie Higson, you discussed that you were working on a new Fighting Fantasy book. What can you reveal at this early stage? Will it, for example, be set in Allansia? SJ: Top secret I’m afraid! AJ: Ian, with you and Steve being the founders of Games Workshop, has the continued success of Warhammer Fantasy/Age of Sigmar and Warhammer 40k surprised you? Do you have much continued involvement with the company? IL: Steve and I are no longer involved in Games Workshop but watch its ongoing success from the sidelines with a great sense of pride. Who would have thought that the company we started in a pokey flat in Shepherds Bush in 1975 would turn into a hugely successful multi-national? AJ: Steve, since your early days with Ian as pioneers in making roleplaying games popular in the Uk and Europe, do you still have as much passion for the games now as you did then? SJ: The games I mainly play these days are German Board Games and Apps. I haven’t quite got the concentration I used to have to read 100-page rulebooks! AJ: Ian, as a long time Dungeons and Dragons fan, what are your thoughts on the successful 5th edition? And do either of you still play? IL: By all accounts the 5th edition is brilliant. But we no longer play D&D. We regularly play board games in a group which has been together since the 1980s. AJ: Steve, has the recent upsurge in popularity in roleplaying/ board games surprised you? SJ: Yes, indeed. The Japanese version of the AFF Rulebook has sold almost 2,000 copies in the first couple of months! I can’t believe it – after 35 years! AJ: Ian, what plans do you and Steve have for the Fighting Fantasy series going forward? IL: There are going to be more digital adaptations of Fighting Fantasy. 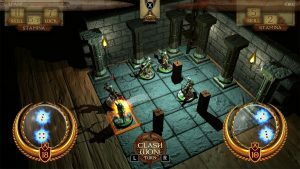 Tin Man Games and Nomad games have launched some fantastic games over the years, most recently The Warlock of Firetop Mountain on Switch and Fighting Fantasy Legends on mobile, and there are plans for more. I’m currently working on ideas for a new Fighting Fantasy book and hope to begin writing soon. And the 40th anniversary will be upon us before we know it. Steve and I always planned to write another adventure inside Firetop Mountain for the 40th anniversary, so we better get started on that soon too! AJ: Steve, what roleplaying / board / video games are you currently a fan of? SJ: Our Games Night group plays 4-6-player games like Dominion and Splendor. And I often play 2-player games – Jaipur and Morels are current favourites. AJ: Ian and Steve, aside from Fighting Fantasy, what projects do you have lined up? Steve and Ian at a book signing last year. IL: I’m writing two non-fiction books at the moment. The Dice Men is a history of the first crazy ten years of Games Workshop (1975-1985) which I’m writing with Steve and Jamie Thomson. The second is a yet untitled book about the history of board games through the ages which I’m writing with James Wallis. I’m also very much involved in the video games industry. I currently sit on the board of eight video games companies – Sumo-Digital, Midoki, Flavourworks, The Secret Police, Bossa Studios, Mediatonic, Fusebox, PlayMob and Antstream. Whilst I endeavour to give them sound business advice, it’s the involvement in their game designs that gets me most excited. It’s the creative process that I enjoy the most. SJ: The new book is still some way off and is taking most of my time! Many thanks to Ian and Steve for their time, their photos, and their answers. Charlie Higson’s Fighting Fantasy book, The Gates of Death, is out now, and is worth all your pennies. To see the current range of Fighting Fantasy titles available from Scholastic, visit their website. If you’re looking for the vintage titles still out of print, try eBay and Amazon, and your local charity shops. And please check out the official Fighting Fantasy website.